The last train to Ardlamont on Argyll's Secret Coast. 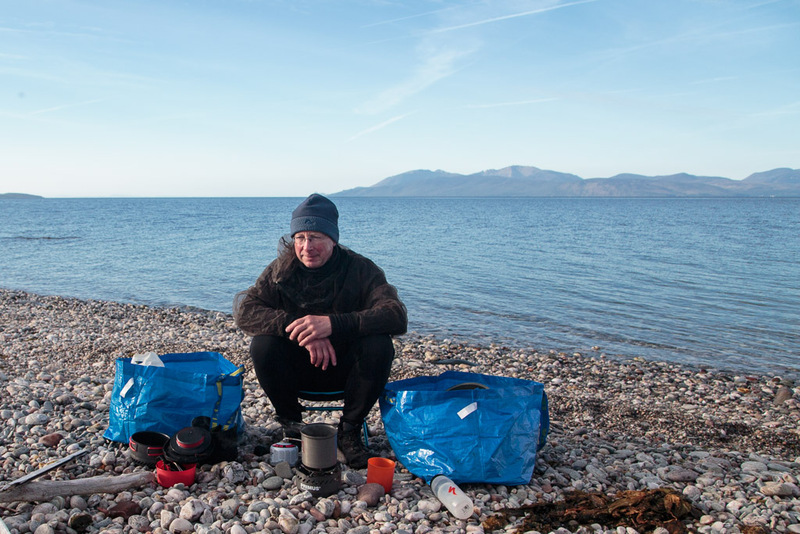 We woke on the shores of Ardlamont to discover that the wind had dropped overnight and the midges were all round the tents. 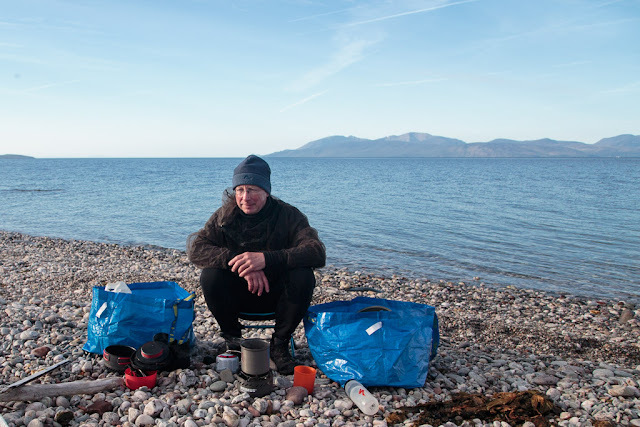 They were not too bad on the beach so that is where we set up our breakfast things. We were not the only ones to be up early. The crane barge Forth Constructor was making her way down the Sound of Bute. We were on the water by 08:30 and paddled from Ardlamont Bay round to Kilbride Bay. Three eagles were soaring high overhead but that was not the only thing that caught our attention. 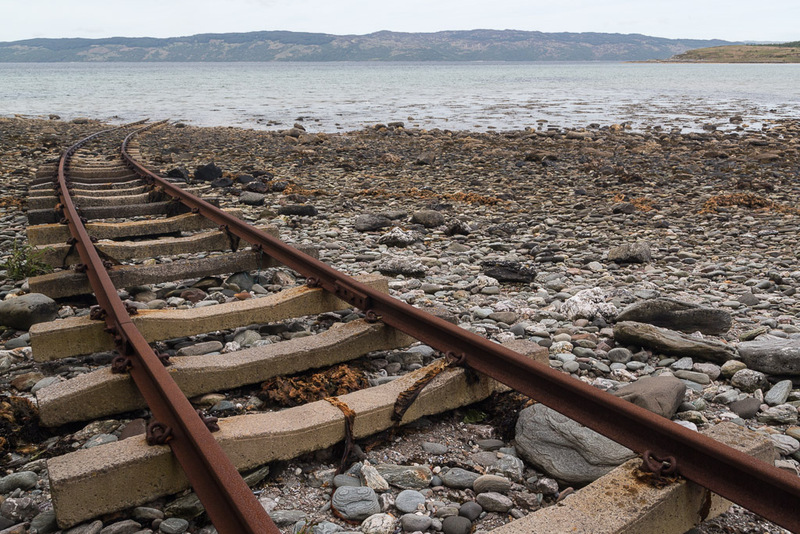 We came across this standard gauge railway track that curved gracefully into the waters of Kilbride Bay. We decided to land and investigate. I had first heard about this railway to nowhere in Kilbride Bay back in the 1970's but had only found it a few years ago. I had heard about it from an old man in the bar at the Colintraive Hotel while I was on a yacht trip. The skipper of the yacht I had been crewing in had been in the Army and ended up as a prisoner of war in a Japanese camp. The old man had been a in the Royal Navy and had been involved with WW2 naval training exercises in the Cowal area prior to the D day landings. So it wasn't long before the pair of them were swapping yarns. He told us the the railway was for launching and recovering midget submarines on a wheeled trolley. 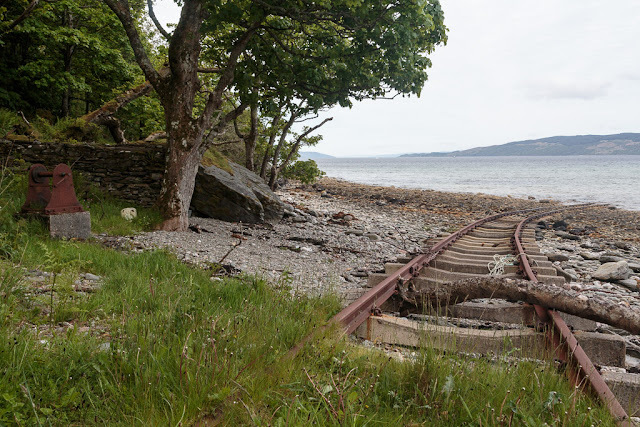 Elsewhere on the internet you will find some who believe it was used to deploy an anti-submarine boom across Loch Fyne. 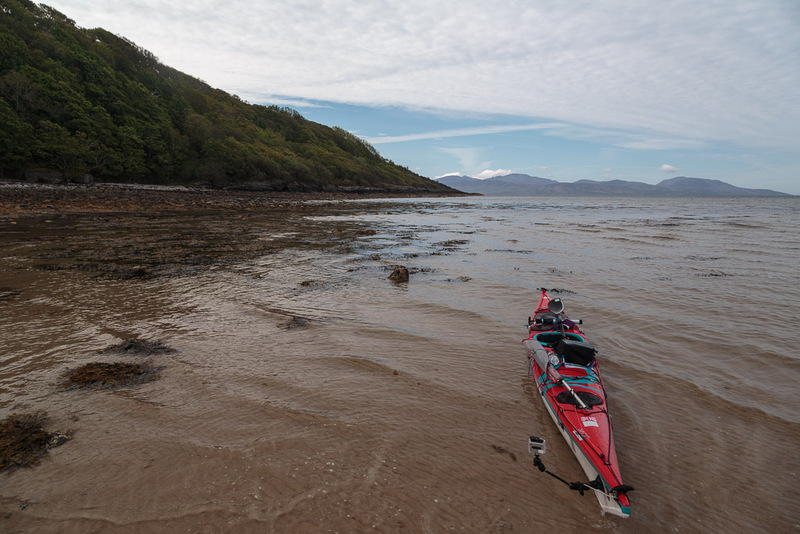 However, this would not be a sensible place to run a boom across as the mouth of Loch Fyne is 4km to the west and then the loch is a further 3km wide at that point. 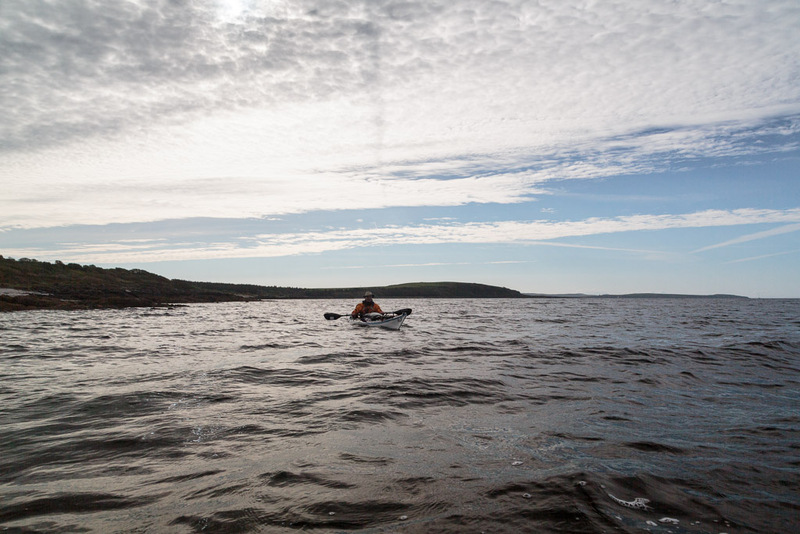 The submarine boom was actually deployed 22km further up Loch Fyne, where the spit at Otter Ferry narrows the loch to 1km. 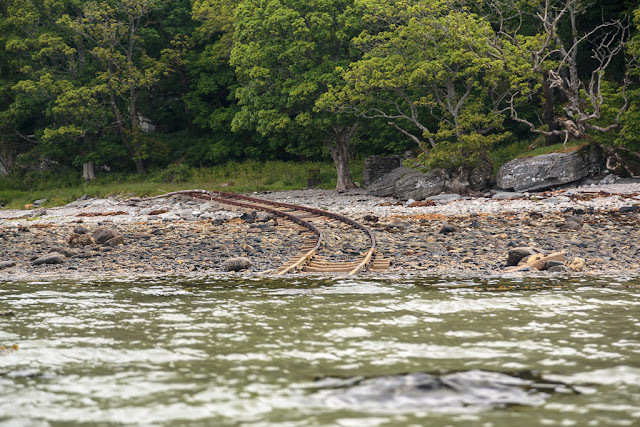 The shore structure identified with the Otter Ferry boom is listed on the Canmore website site 205007. 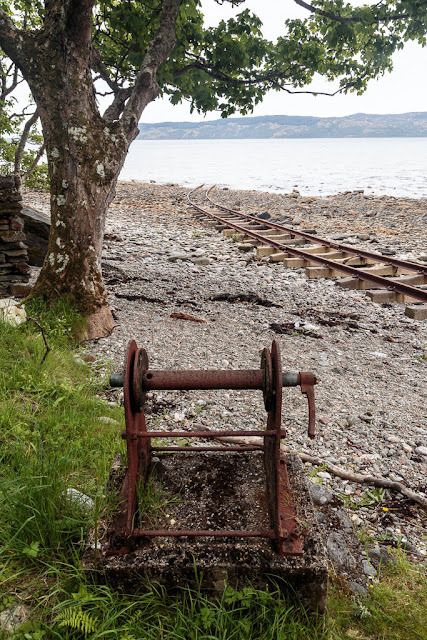 Nowadays, this area is marketed to tourists as Argyll's Secret Coast. In the dark days of WW2 it really was a secret coast. Ardlamont Estate (and much of the Cowal peninsula) was requisitioned for Combined Operations training in Naval and amphibious landing warfare. About a quarter of a million troops were trained here and Lord Louis Mountbatten, the head of Combined Ops even stayed in the nearby Kilfinan Hotel. Whatever, if you find yourself on the last train to Ardlamont, I suggest you get off at the stop before Kilbride Bay. It is a pretty wet journey after that.